One of the best things about using Snapshot™ is the ability to use it for entity management. Snapshot™ stores a comprehensive table of your entities, allowing you to easily view all of your companies and what services you have in one place! To take advantage of our entity management tool, login to Snapshot™, then click on “Entities” in the top gray navigation bar, or click on the first graphic on the home page that is labeled “View details about your entities.” This will take you to your entity management page. Once there, you will see all of your entities listed out, along with other important information, such as the state the entity is formed, incorporated, or qualified in, the entity’s company number with us, and the status with Incserv. 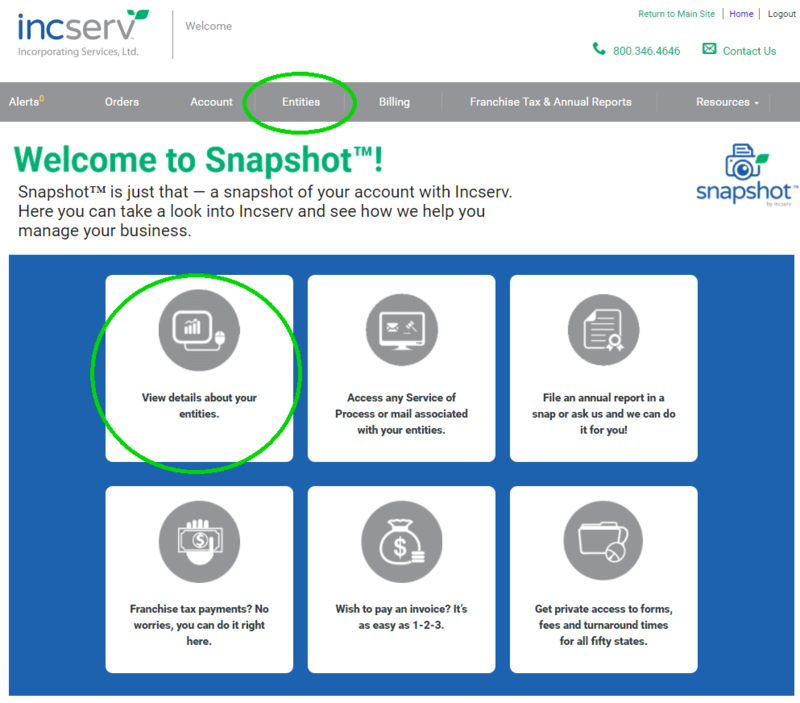 Other important items to note are whether the entity has SOP on file that you can view (the circle will be green if it does) as well as what enhanced services this entity has with Incserv, such as Mail Forwarding, Annual Report Services, and Virtual Office. If you click on the name of one of your entities, Snapshot™ will bring up additional information about the entity, including the billing period, the contact we have for sending Service of Process, tax notices, and invoices, and much more! 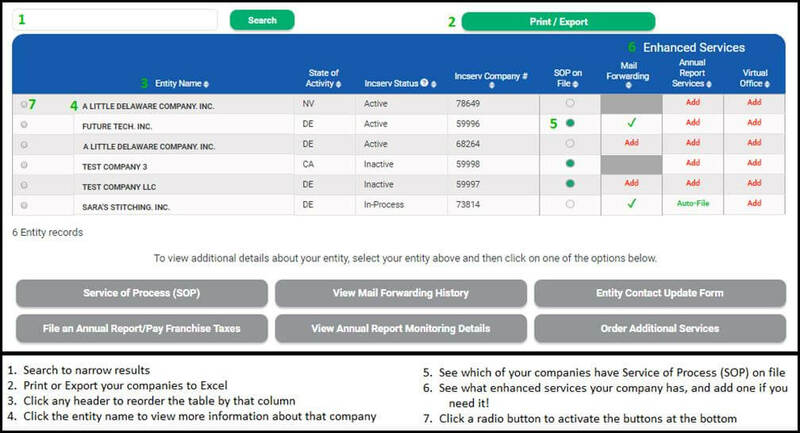 By clicking on the radio button next to one of your entities in the entity management table, the gray buttons at the bottom of the screen turn green to indicate they are active. You can use the buttons to view SOP on file, update/verify this entity’s contact information (a yearly requirement! ), file your annual report (currently only for DE entities), add Annual Report Filing Service (or complete your verification form if you are already signed up for ARFS! ), or order additional services, such as mail forwarding, virtual office, or even a Good Standing Certificate! If you have many entities on your account and find it hard to navigate them all, you can use the “Search” function at the top of the entity management table. This will limit by the name of your company, the State of Activity, or the company number. You can also click on each header to reorder the table alphabetically or numerically by that column. Finally, you can use the “Print/Export” button to pull up a separate page with all of your entities listed with their details. At the top right, you can choose to print the page or to export to Excel. We hope you find our entity management tool useful! Up next, we’ll delve a little further into how to fully utilize the franchise tax filing and annual report filing service options in Snapshot™!